Reposted from my Goodreads blog dated August 27, 2017. I wanted to consolidate a bit, and bring this post over to our author website as well. 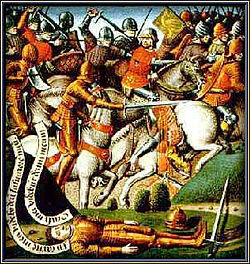 I was reading some background on the Battle of Roncevaux today with my son, William, which occurred on August 15, 778. During that battle, the rearguard was ambushed and those events set in motion the retelling of the tale that would be sung by the army of William the Conqueror on the eve of the Battle of Hastings. Yet, La Chanson de Roland has some issues with time that we attempted in The Silver Horn Echoes to account for. You see, in 778, Charles the Great (or Charlemagne) was a man in his early 30s. He had just fought the Lombards in Italy for control of the northern portions of the peninsula. He was yet to bring further Italian territory under control. Then on Christmas Day 800, while he knelt in prayer, Charles was crowned emperor of the Romans by Pope Leo III. The Chanson de Roland sets up a fictional world where the Battle of Roncevaux takes place when Charles is already the emperor. In the poem, Charles is both emperor and king. The title was usually bestowed (though jealously) by the Eastern Empire in Constantinople. Further, Charles is old and wizened, with a long flowing white beard. So when writing The Silver Horn Echoes, both in screenplay and novel forms, there were some creative choices to make. First, we could build a world that was more historically accurate and place Charles and his vassal Roland earlier in his career. Or we could go with the world spun by the poem and create a world in which the events of the Song of Roland are plausible. I chose the latter. This creative choice allowed for two things. First, to remain truer to the telling in the epic poem. Second, there is a lurking danger in The Silver Horn Echoes represented by a very jealous and manipulative Byzantine Empire. You see, when the pope crowned Charles, the usual negotiations with and permissions from the Empire did not occur. After the crowning, Charles was thrown into negotiations with the Empire to legitimize the title. So we were able to use the world created by the poet and accomplish a retelling that focuses on an older Charles and his taking up the mantle after 800. The Silver Horn Echoes: A Song of Roland is a work of fiction that is inspired by the mythical world of La Chanson de Roland. Thus, as storytellers, we pay homage to the battle of 778, but are not completely bound by the events. This allowed us to use characters and constructs from the poem, rather than be strictly bound by the historical record. We hope you enjoy the creative choice. And we hope that it inspires you to learn more about the actual events surrounding the Battle of Roncevaux in 778.